Many more hours are burned these days watching videos on YouTube than listening to songs on a radio. According to YouTube, more than 1 billion unique users visit the site each month. YouTube bills itself as “Broadcast Yourself” so you’d think that you might find only homemade videos. That’s not the case. Big-time studios post portions of television shows and trailers from films. There are 6 billion hours of video watched each month on the site (about an hour for every person on the planet). If you haven’t visited the site, you should. 1To find a video to share, start by typing a keyword in the search box on the home page. You can search for topics, actors, singers, politicians . . . just about anything. For example, type Susan Boyle (of Britain’s Got Talent fame) in the search box, and you’ll get over 396,000 results. 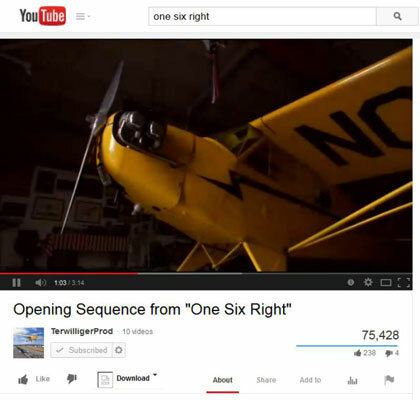 2Search for One Six Right, an independent film on the history of aviation. On the next page (the search results), you see a list of videos that match your search term. In the example, the videos have One Six Right in the title; click the top one to get to the page shown. 3To share a video that you find on YouTube, click the Share button that appears below the video viewing window. A box opens onscreen, showing you the URL of the video and a collection of buttons that link to various online communities — including Facebook and Twitter. 4To share the video on Facebook, click the Facebook button. A window appears and offers you two ways to share. 5To post the video to your Facebook profile page, type your message in the text box and click the Share button. After you click the Facebook icon, a box pops up and allows you to post the video to your Timeline. 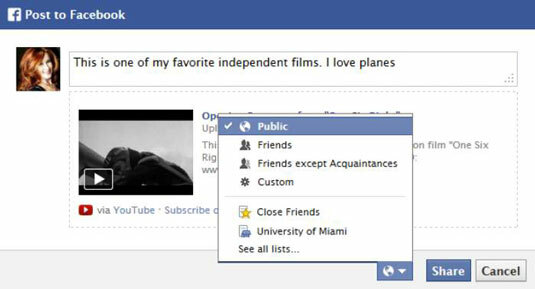 Note that you can toggle the privacy options and decide with whom you would like to share your find. 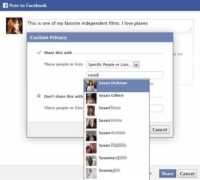 6If you’d prefer, you can send the video link to specific Facebook friends or lists. 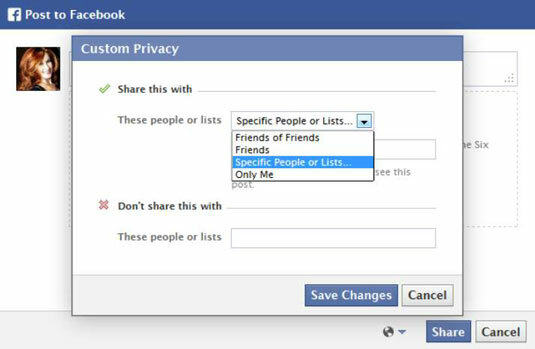 Click the privacy icon next to Share and select Custom. You then see a Custom Privacy window. 7Select from the drop-down list and begin to type your Facebook friend’s name. A list will appear. Select your friend’s name from this list, and the message is ready to send. Click Save Changes and then Share to send it along to your friend’s Facebook message center. 8To share the video on Twitter, click the Twitter button and a second window opens with a message box containing the video’s title and URL. Edit the message if you’d rather say something other than the video’s title, but don’t delete the link. Click Tweet. Your message appears, along with a shortened version the video URL, in your Twitter stream.